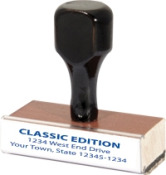 Rubber Stamps Express is what we refer as traditional or classic rubber stamps. These are the rubber stamps that have been around even before your grandparents. Traditional rubber stamps are mandatory for certain applications. A few of these applications include: QC rubber stamps for quality control of marking parts with fast drying inks, Marking of clothes and laundry, and where you need permanent marking on non-porous surfaces. *Disclaimer* If you need any stamps beyond these sizes please contact Next Day Stamps and refer to pricing chart.